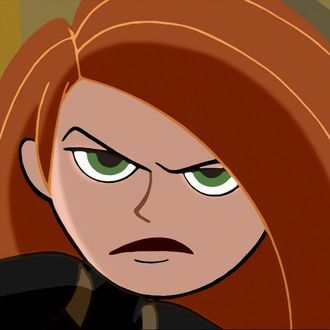 If you put your ear real close to your screen, you might hear the muffled sounds of Christy Carlson Romano shouting “Ron!” Disney, ever in the Comic Con spirit, released the first photo from the upcoming live adaptation of Kim Possible, which is starring Riverdale’s Madelaine Pe — er, sorry, which is starring newcomer Sadie Stanley in the titular role. Ron Stoppable, the dashing naked mole-rat Rufus, and techie pal Wade will also come out to play in the film, but we don’t have first-looks of them just yet. (HIMYM’s Alyson Hannigan will also play Kim’s brain surgeon mom. Cute!) Kim Possible will be released later this year, and while we’re at it, may we suggest a Dave the Barbarian revival as well.